The ancient Al-Fahidi district in the Emirate is home now mainly to labourers from Pakistan and India. Before moving to Dubai, I was overwhelmed with excitement at the thought of experiencing the glitz and glamour of this world-renowned city. On arrival, I was instantly distracted by the materialistic desires that the city advertised so well on blown-up images. A part of my subconscious was telling me to look beyond Burj Khalifa, the luxurious shopping malls and hotels. I was determined to find out the story of the city that underwent major transformations within two decades. Every city has a rich past and Dubai is no exception. As a frequent traveller of the metro, I decided to spend the day as a tourist in the historic Al-Fahidi district. Slinging my camera and another bag packed with essentials on my shoulder, I set off on my personal adventure with mixed feelings of excitement and anticipation. Walking out of the Fahidi station, I noticed how different the overall environment and architecture was. The old buildings from the days before Dubai’s transformation into a globalised city were clearly preserved. I noticed that the people were mainly Indians and Pakistanis, as compared to the Arabs and Europeans I would see at the malls. These migrant workers are often employed in construction work since they never had a chance to receive a formal education. They make the difficult decision of leaving home and are often forced to take loans to be granted a visa. In this locality, I saw them working at stores and sitting at restaurants sipping on their morning chai and eating parathas. 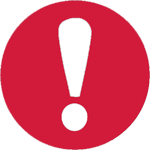 The area is congested with offices of travel agencies, Indian clothing stores, grocery stores and hotels. 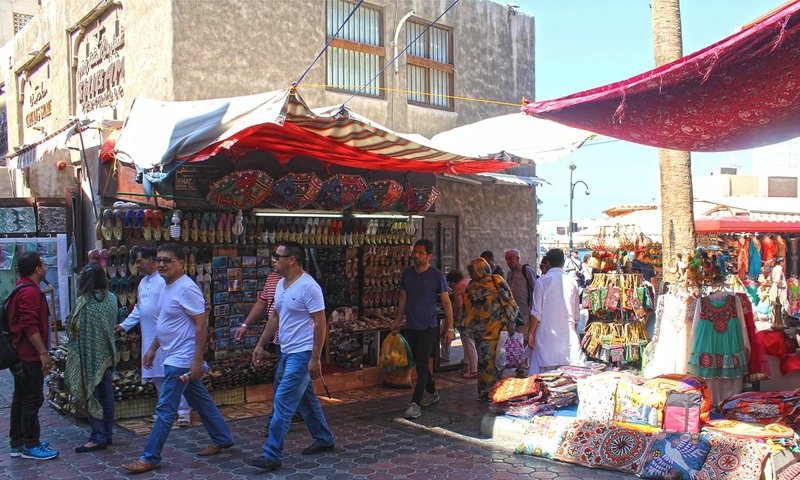 The Al-Fahidi district is also known as Souk Al-Kabeer or Old Town since it is close to the textile and spice market. I noticed that most people were travelling on foot and I decided to walk to Bastakiya. A view of the old district Bastakiya, which I found to be a peaceful haven from the busy city, which has quaint cafes, museums and art stores. 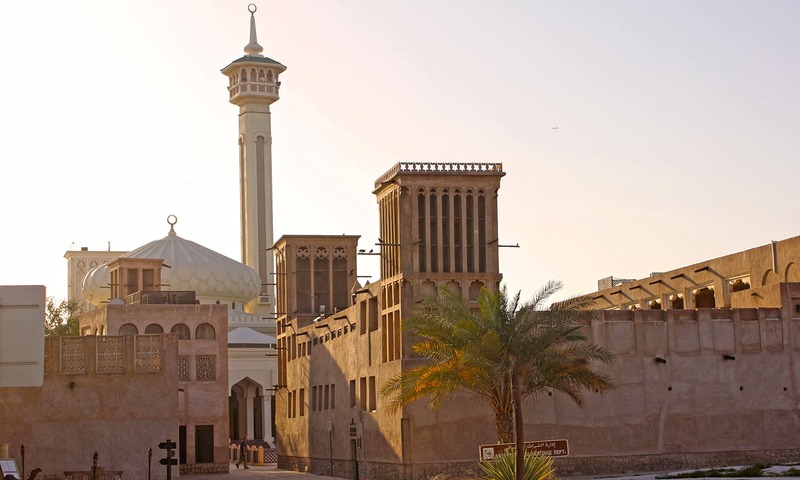 The mud-brick structures had wind towers that were old artefacts from the 18th century when the Bani Yas tribe was the only inhabitants of this trade and fishing village. Wind towers were used for ventilation before air conditioners were introduced. 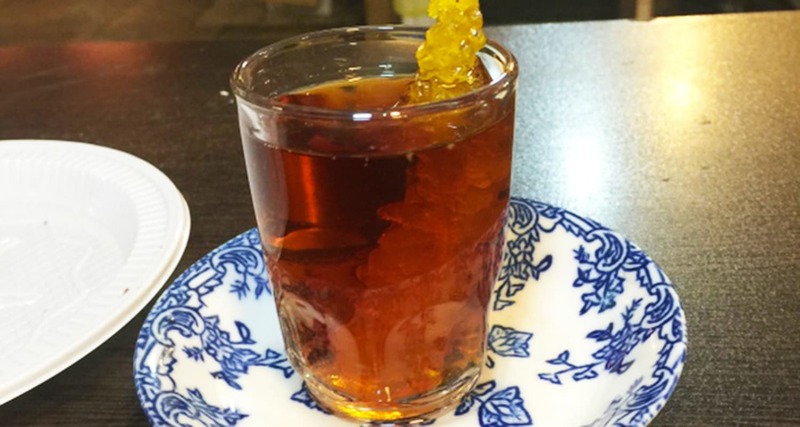 They are remnants of those introduced by the Arab merchants who had moved to Dubai in the mid-1800s as the Iranian government was persecuting the Sunni Muslims. Some of them managed to escape on foot, and while migrating, they would take breaks and say “basta” meaning “Stop here.” Eventually, the Arabs said “basta” for the last time when they reached Dubai in the 1920s after seeking refuge from the founding father Sheikh Maktoum who provided the merchants with a plot of land they named Bastakiya. As I walked through the narrow pathways, I felt a sense of peace in the calm, quiet neighbourhood. 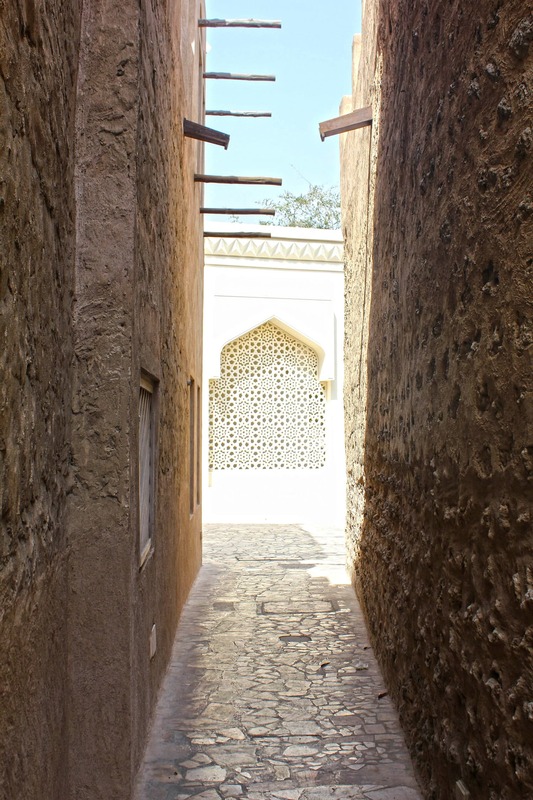 One of the many narrow alleys leading to the mosque in Bastakiya. I noticed a brown, palm frond structure with a traditional, brass handled wooden door that was ajar. Above it was inscribed ‘Coin Museum’. Built at the end of the 19th century, the museum has several rooms where ancient coins dating back to the early days of the UAE in the 1800s are housed in glass cupboards. As I was leaving, the guard asked me to sign the guest book along with my comments. He told me that he was a Pakistani and had moved to Dubai several years ago. I commented on how the modern side of Dubai was so radically different compared to the older areas of the city. What he said made me realise how predictable it was to see desis doing such jobs even while living outside the country. The South Asian labour force, which makes up 53 percent of the population, not only receives low wages but also live in difficult conditions. Their camps are usually far from the city and sharing a room with many others is not an ideal situation. But they make the sacrifice because they have no choice. They are the only source of support for their families back home. 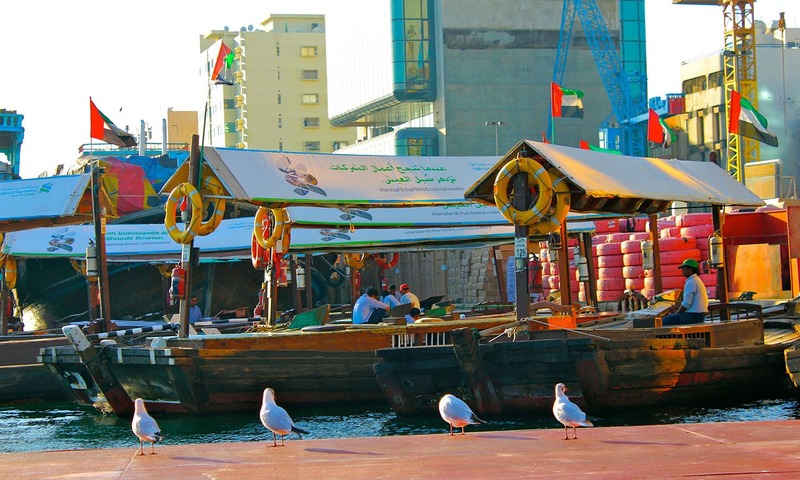 As I walked ahead, I reached the Dubai Creek where I saw many traditional boats — known as abra — passing by, packed with tourists and workers. While walking towards the dock, I noticed a few stores lined in front of the port. I walked into an Indian clothing store that was filled with material for saris and shalwar kameez. The shopkeeper, who looked as ancient as his surroundings, was sipping his evening tea. He told me he was Indian, then immediately guessed I was Pakistani. He had witnessed the major transformation the city had undergone while living here for more than 30 years, working in the clothing trade business since he moved. 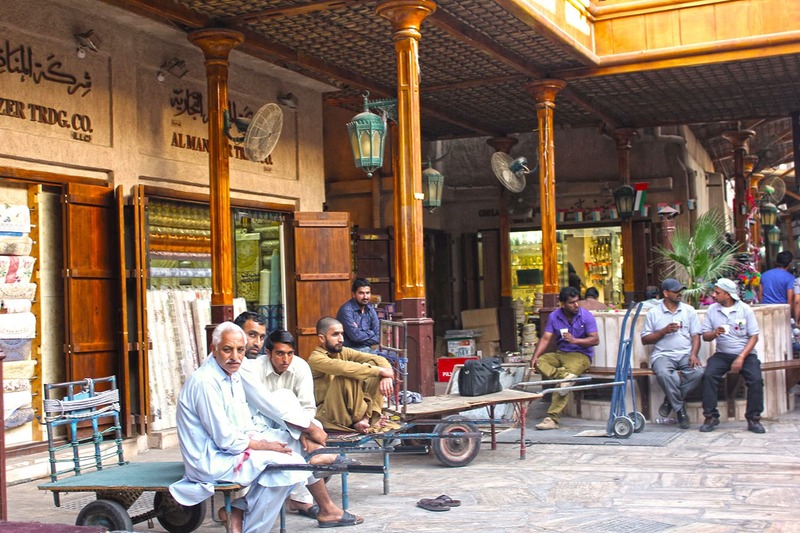 Pakistani and Indian workers socialise and have tea in one of the courtyards of Souk Al Kabeer in the Fahidi district. From Dubai Creek station, I took a ride in the rickety, wooden abra; the journey surprisingly cost only one dirham. The abra was introduced in the early days when the creek was the main hub of commercial activity in the city. It is still a common mode of transportation carrying 15,000 passengers every day, as it is the easiest way to travel to various points of the long, outstretched creek. I could feel the wind surrounding me during the ride, and for a moment I closed my eyes and imagined the workers who knew nothing else but travelling by boat. I felt a tinge not of sympathy, but jealousy. 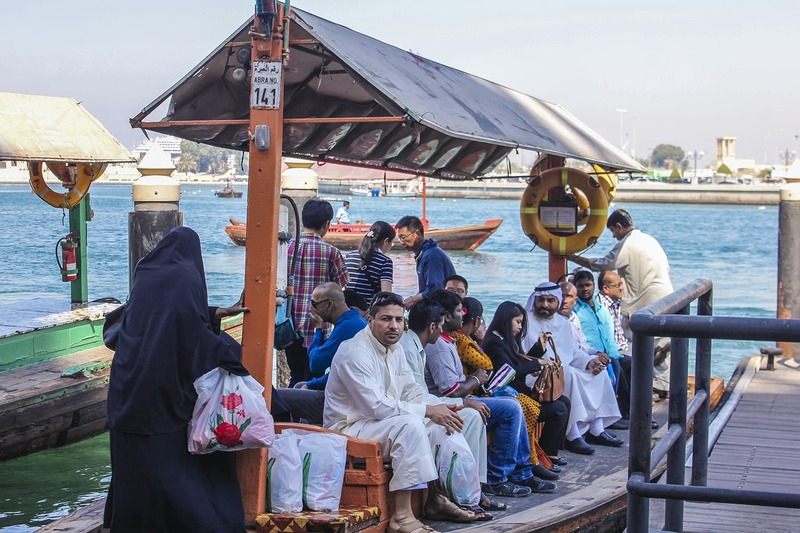 There is always a mix of people on the abra rides, which has stopovers across the entire Dubai Creek. After the boat ride, I walked ahead to the spice souk, also known as Souk Al Kabeer. There are countless stores selling spices, souvenirs, foodstuff, Indian and Pakistani traditional clothing and shoe stores. Stopping for a break at a juice centre, I noticed that the sellers in all the stores were Pakistanis and Indians. This suddenly made me realise that I had not seen a single Emirati during my entire trip. As shop sellers and tourists walked past me, I continued to scan the area for the sight of a local, but failed to spot any. Perhaps they prefer to live outside of Dubai, which is heavily populated with foreigners that make up a staggering 90 percent of the population. As I walked through the narrow alleys of the souk, I noticed the diverse range of visitors and didn't spot many locals, similar to most areas in Dubai. As I walked out of the souk, I approached a long stretch that was a continuation of the creek, where I saw an unloading and loading dock. The creek passes through the heart of the city towards the trading port that leads up to the Ras Al Khor Wildlife Sanctuary. The port dates back to the late 1930s when the pearl industry was the main source of income, which was eventually affected by the higher quality pearls found in Japan. 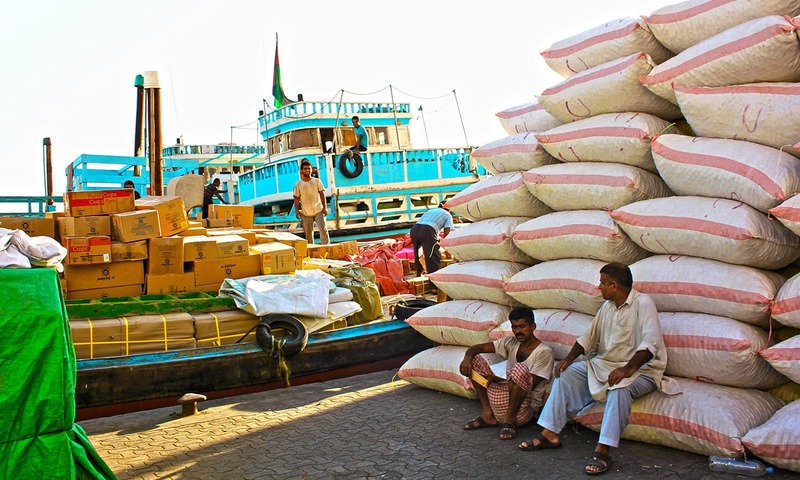 The general traders and local tribes, Bani Yas and Al Bu Muhair, had an economic slump as a result of this and eventually began seeking an alternative source of income. There are several stations at the creek where you can buy tickets for a ride in an abra, which are parked at the dock. As I looked towards the port, I saw Indian and Pakistani workers unloading cargo from multi-coloured vintage boats that lined the dock. As I stopped to take photographs, I approached them and they immediately asked me, “Do you like Dubai or Pakistan better?” I told them I preferred my home country, to which they agreed and said they missed being back home but circumstances made them come here to provide for their families. The old boats lined along the creek are always bustling with activity as workers unload products that are exported from around the world. I was amazed by such camaraderie between Pakistanis and Indians and how they were living in peaceful coexistence. I thought how unfortunate it is that people back home aren’t accepting of our neighbouring country. As I gazed beyond the glistening waters of the creek, the sun started to set. The horizon dipping over the Burj Khalifa in the distance was the only hint that I was still in the modern city of Dubai. 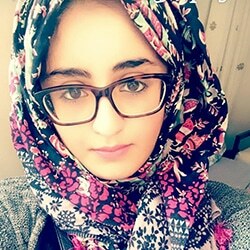 Ayesha Islam is currently working at the blogs desk at Dawn.com and she is passionate about traveling, writing, and photography. Enjoyed reading as have been living in Dubai since June 2007 and the city has changed so much even in these 10 years. Metro has been the best addition to this city since then. Great article about Dubai-UAE where I had the opportunity to live & work for a German Engineering Conglomerate as a Project Engineer for about two decades. Nevertheless, during my recent visit to UAE, it was amazing to see Dubai's transformation into a real modern city with prices of everything and anything going up by at least 300 to 400 percent. In fact, the "abra crossing" in my times used to cost only 25 fils. Similarly, an average "shahwarma" sandwich those days was priced at Dirhams two only. Incidentally, a pair of shahwarma sandwich constituted my dinner after floodlit cricket matches in our cricket ground located behind the Al-Wasal Sports Club & the Sheikh Rashid Hospital. The same shahwarma sandwich now costs Dirham five only. Similarly, everything in UAE has become very costly now.The metro system of public transportation they have is structured above the ground since the tensile strength of sand is almost zero as compared to the natural soil at other world's places. I like old Dubai. Very peaceful. Kashmir Divides but Dubai unites !!! Very informative and nicely put article. I think Dubai has a tourism department.More tourists needs in Pakistan than Dubai. Thanks for this wonderful text. India and Pakistan have more commnality than differences. May God bless both the country. Insightful article. I'd rather gladly brisk through the old pebble lined souks where everyone ackowledges you with a warm smile, than going through marble floored shopping malls lacking soul. nice article, the Indian, Bangladeshi, Pakistani love-hate bond co-exist in UAE to be witnessed during any cricket match. Dubai - UAE progress is purely based on sweat of Expat labor community without any labor laws & human rights. All of them one day has to return home only with memories, the Love bond they share with their fellow workers, and few hundred thousands saved back home. Nice article ! in this article I read and saw the other face of Dubai. Thanks for sharing all this information. I must sure our homeland is always be missed by our Pakistani fellows. very true.I experienced the same when i visited Dubai. When Dubai Sheikhs will learn to treat workers as humans! You should visit sonapur or international city next time to find out more about dubai. I lived in dubai for 30+ years and still living in it. But miss my Pakistan more. Very good article. Thanks Dawn for publishing and well Ayesha deserves praise too. Thanks Ayesha, good bless you. One of my Uncle too works in Dubai. Dubai is feeding so many indian, Pakistani and Bangladeshi and well, obviously in exchange Indian, Pakistani and Bangladeshi are making Dubai shine. thanks for a very nice article, This kind of places is alive in many cities , with narrow roads , small shops filled with bustling people who will reflect the very soul of the city . They form the backbone of the labour that built the more posh looking urban areas. These are the people who will teach everyone how to live and what is life about, in harmony, and how humble we should be in this big universe(like a drop in the ocean) . no doubt Dubai is a city built on the toil of the indians and pakistanis together. A layman view of Dubai expat life. The author should have taken a trip to Sonapur and peeked in the congested flats where 4-8 people share a single room. This is very informative.. thank you. More pictures next time please. 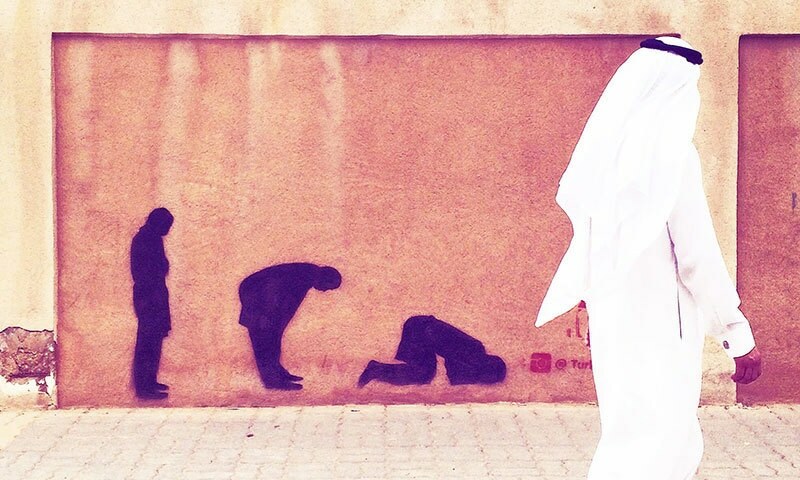 Love the stories, but the pictures speak a thousand words. United Arab Emirates is build on the sweat of Migrants particularly from Pakistan, India and Bangladesh! Grew up in AUH. Never seen this side of Dubai. Lovely pics. Hope to visit soon. Good try but like what's so great about what you wrote? This is the better lives of Pakistanis and Indians in Dubai. You should have ventured into construction sites. And buildings where ten men are crammed into one teeny room with their passports taken. Those are the real leaves. Please write about them. Nicely written article. Would love to read your next observation, perhaps a bit deeper in the Emirate's life. Kudos for the simplicity. You have managed to glorify this. Go a bit further into Al Quoz, Sonapur and have a look at the labour camps. Then you will see the other side of Dubai. @BEYONDSKY And shame on the people for voting them in, term after term! Dubai has been built with the genius and swae/blood of sub continent labour. When they built the Burj, the local authorities wanted to dump all the labour and bachelors in a transit camp miles away from the city. Then God opened his eyes and 2008 crisis started. Now at least the local authorities are not talking of dumping labour to far way ca,ps! I recently visited Dubai after 30 years. Lot of it has changed but the social, and living conditions of South Asian workers is saddening. The Local Emirates do not mix with the majority of people who worked and laboured to make the Emirates what it is today but prefer to patronize the western culture and their former masters. Thank you for sharing such an insightful and interesting story about the other side of glamorous Dubai. @ritesh It shows that economic necessity trumps all. Something that both Indians and Pakistanis need to understand and embrace. It is always like that. If you go to UK, Indians and Pakistanis are friends.Same is true in the middle east. Only in our own countries, our ego overtakes human bonds. I have visited Dubai four times in the last few years. Pakistanis and Indians in Dubai have lot of affection for each other. We both speak the same language call it Hindi, Urdu or Hindustani. I interact a lot during taxi rides, the drivers are mostly from Pakistan and I have found them always happy to chat with me, a visitor from India. I am sure visitors from Pakistan also would find the same comfort in talking to Indians there. Away from our own country we both realise the goodness of each other. Enjoy reading it, good to know the other face of Dubai. Millions of migrant workers enter Dubai and are unable to leave the country since their passports are usurped by construction companies and they are paid half the amount of wages they are promised before the contract. Furthermore, their living conditions are extremely deplorable. Workers are deprived of even basic sanitation facilities and live in tiny, dingy apartments with at least a dozen other people. While it may be willing to sell a great deal and lure people to its magical land with all the other great magnificent features, the facade of an adult Disneyland in Dubai is now collapsing. People come, live in amazing big apartments, pay no taxes and live a wonderful life. However, very soon, the covert debt they had been taking, piles up and the ‘do-buy’ drug stops lulling them into a deep sleep. Great writing, traveling is so much learning. Can one find more-affordable accomodations/hotels in Old Dubai? New Dubai is much more expensive! @Bashir elwin: Much the same America was built by the blood, sweat and unpaid labour of the black Africans bought as slaves. Socialize? They are looking the other way. You can't weave non-existent friendships. What you experienced is just normal courtesy to all humans in the world. Those people are there to feed their families, not camaraderie. I felt the 'apartheid' on my visit to Dubai. I was residing in Dera. While visiting the places, I realized that around Dubai, the people dealing the affairs were all foreigners: Philippines running restaurants & administrating hotels , Pakistani & Indians working on construction site & driving cabs. I came across to locals very rarely, if any at malls. Despite colossal investments & profits from gigantic building Emirates could not put money in building large mosque in public areas as people were offering 'juma' on streets. 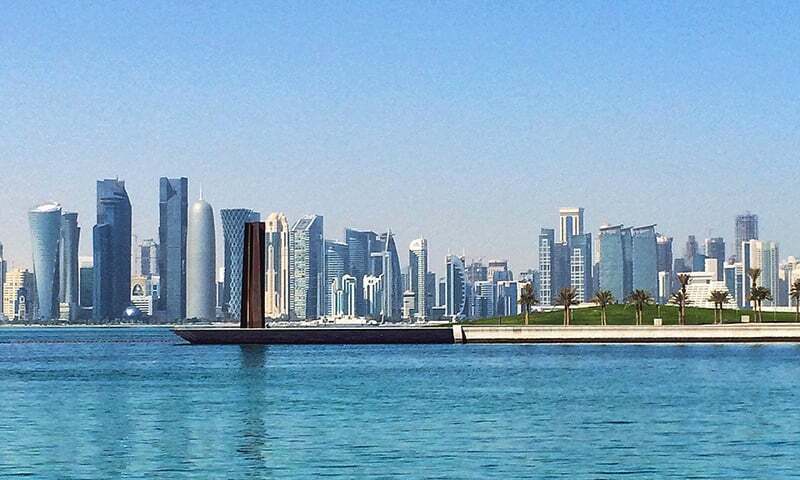 While the spatial mosques like one in Abu Dhabi is more of a tourist spot & out of reach of public.